I was invited along with Igarashi shihan, to the 25th Anniversary celebration of Ron Christenham shihan's Sarpy Aikido Club in Nebraska. The club is the Nebraska branch of the Aikido of Hawaii International, the association headed by our long-time friend Robert Kubo shihan, who we have had relations for over 40 years. After the festivities in Nebraska, Mrs. Igarashi and my wife joined us on Oahu in Hawaii to celebrate Kubo shihan's 80th birthday as well as his promotion to 8th dan. Ms Tsuchiya during her uchideshi training. This trip became a 16-day excursion that took us to Denver, Nebraska and Hawaii. Kasahara, Instructor of Aikido Kobayashi Dojo, was with us in Denver and Nebraska and returned to Japan on June 8th. Because of Mr. Kasahara's fluency in English, I was able to have a great exchange with the members of the Nebraska association. After the seminar, Igarashi shihan and I looked towards Hawaii. We were met at the airport by our wives, who had arrived the previous day. 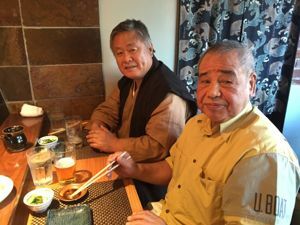 We stayed one week, for practice and for celebrating Kubo shihan's 80th birthday and his promotion, returning to Japan June 16th. Igarashi shihan had checked out the route to Nebraska through Denver on United Airlines. 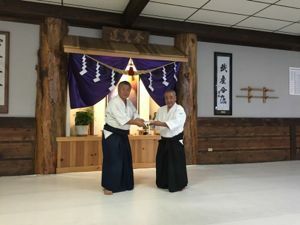 Denver is home to Nippon Kan, a supporter of Aikido Kobayashi Dojo, headed by Homma shihan who teaches Aikido there as well as to the Nepali Army in Nepal. As it happens, he was in Nepal during the devastating earthquake and was involved with relief efforts. Aikido Kobayashi Dojo cooperated with these relief efforts, raising over ¥70,000 in a month. To hand over our donation, I preceded Igarashi shihan by two days and was the guest of Homma shihan in Denver. The dojo in Denver welcomes young people and students practicing in Aikido Kobayashi Dojo and its affiliates, allowing them to stay and practice there at little or no cost. They are especially encouraged to come and train for more than a month during the strict summer training period in August. Nearly ten young men and women have trained there. 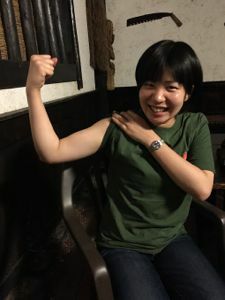 From April to the end of June, Ms Tsuchiya of Miyazaki University Aikido club was training in Denver. Because Homma shihan of Nippon Kan teaches Aikido to the Rangers of the Nepali Army, he has been assisting fundraising for the relief efforts in the aftermath of the big earthquake. I collected ¥70,000 from individual Dojos and presented it to Homma shihan during my two-day stay. Homma shihan treated me to dinner at the Sushi Den, a famous sushi restaurant that takes in over ¥2,000,000 a day (about $18,000). It appeared that we had reservations for that Monday at 7pm. The restaurant had a different kind of atmosphere than a Japanese sushi restaurant, offering all kinds of dishes that I sampled. 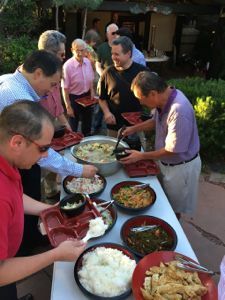 There were over 35 special sushi chefs on hand. The owner's brother gave us the best seats in the house. Homma shihan knows the master of Sushi Den quite well, and suddenly, without any prior notice, he appeared and presented Homma shihan with $10,000 for the Nepal relief efforts. The night before, nearly sixty dojo members witnessed my handing over our donation of ¥70,000. Homma shihan was very pleased with all these contributions to the cause and expressed his gratitude to me for our gift. 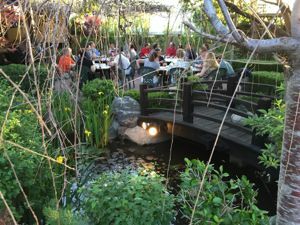 After a short practice that night, we retired to the garden of a Japanese restaurant, DOMO, contingent with the dojo, where we enjoyed dinner together. While we ate, we looked through old photographs of the founder, Ueshiba Morihei, from the time I was a deshi at tHombu, 1955~1965. If Homma shihan would allow me to humbly say, the food was the best this side of paradise. Homma shihan informed me that our donation will provide educational funds for Nepali children for a year. When I receive any more information from Homma shihan on the relief efforts, I will post it here.